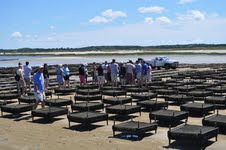 Big Rock Oyster Company has been a helpful supporter of MOP and our mission of restoring oysters to the estuaries of Massachusetts. Aaron and his team have hosted tours of their farm, provided oysters for our events and even talented shuckers to open them.We were pleased to see that they have opened a web-site as their farm is significant with over 3 million oysters. You can visit their site and order oysters or their popular raw bar by clicking on the name above or in the links section on the right of this page. We were pleased to see an article in the Wall Street Journal describing Jim Ferry who works at Big Rock as a second career. Jim is a former management consultant and executive who has found his second calling at the East Dennis farm. Says Jim "I love working outside in a beautiful setting alongside some the nicest, most interesting, hardest-working people I've ever met."